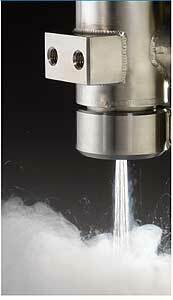 Chart Inc. has been mastering liquid nitrogen (LN2) dosing for over 25 years. 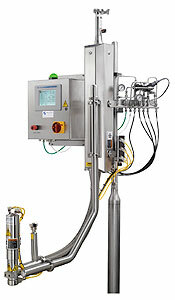 Based on the physical characteristic that one part of liquid nitrogen warms and expands into 700 parts of gaseous nitrogen, Chart dosing systems are used to pressurize and/or inert (N2 flush) products and its packaging. 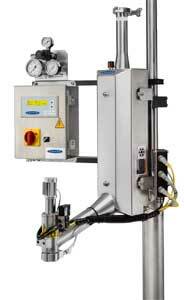 As new packaging technology and products evolve, so has a demand for refined dosing results. Chart has met the challenge with innovation, key partnerships and detailed application analysis. 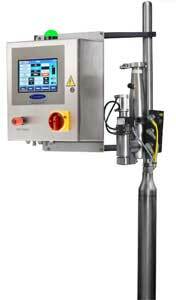 The CryoDoser® is the premier liquid nitrogen (LN2) dosing system utilizing advanced cryogenic technology and PLC programming. Three sensors detecting line speed, timing, and bottle presence allow the system to detect all lines speeds, including high speeds, to dispense a precise dose of LN2 into every container every time. The LN2 gasifies and is either trapped in the container to add rigidity or escapes with oxygen to inert the headspace. The UltraDoser® is the multi-purpose liquid nitrogen (LN2) dosing system utilizing advanced cryogenic technology and PLC programming. Chart engineers designed an ultra-efficient system for low to medium production line speeds to dispense a precise dose of LN2 into every container every time. The Inerter™ is a large volume liquid nitrogen (LN2) dosing system for full container and high-volume headspace inerting applications. Chart engineers designed an ultra-efficient system to dispense a precise dose of LN2 into every container every time to displace the oxygen in the container. When compared to traditional gaseous nitrogen flushing applications, the Inerter provides better consistency and reduces LN2 consumption and cost.